The winter is coming rapidly and as much as I love wrapping up in warm coats, woolly hats and coming home for hot drinks. It also means MUD. Lots and lots of mud, and being a dog owner that mud isn’t just over me and the kids, it is all over the dog too. This was Gus last winter when he was a puppy, nothing has changed!! It feels like a constant battle to keep the house clean. With kids and a dog, it’s one that I can never keep on top of. 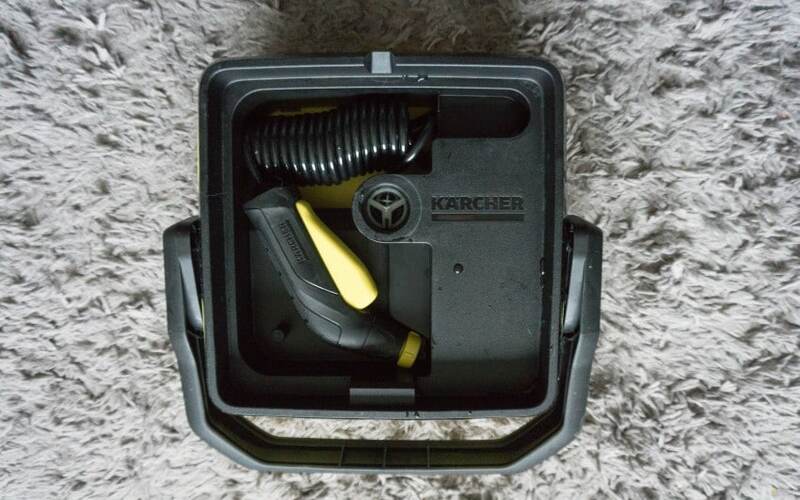 So when Karcher offered me the chance to try out their Karcher Portable Cleaner, I knew this would be a great help for me. What can your use the Karcher Portable Pressure Washer for? The Karcher pressure washer is super compact, measuring 277 x 234 x 201mm it is not even the size of a A4 piece of paper. This is perfect to store in the boot of the car, ready to use after your walk. You could also place it in a garage/side path to use when you return for a dog walk, or out in the mud with the pushchair. Don’t think that because it is small in size that it won’t be able to perform well. It has a 4 litre water tank which holds plenty of water, enough to wash the dogs legs, his under belly, and our 5 boots off well. 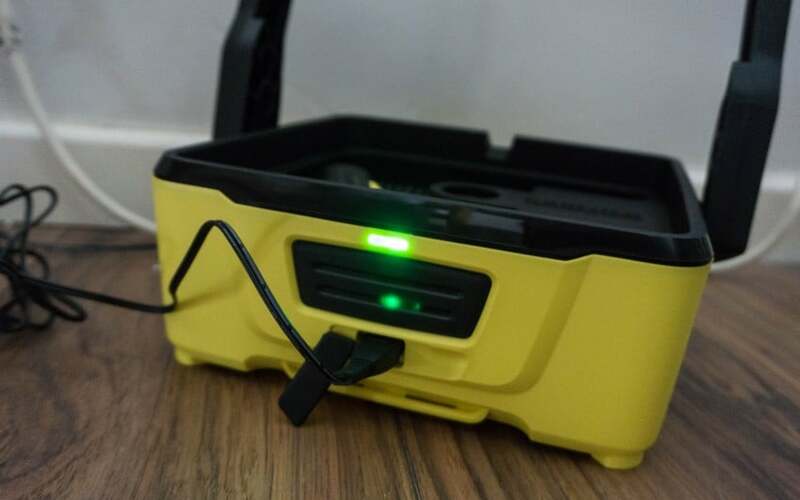 If you are having to carry the Karcher Portable Cleaner around, you are going to want it to be light enough to carry. It’s around 2.2kg so super light weight and even once filled with water you still can carry this easily. The carry handles take a little to get use to, as they lift and lock into position in certain ways. 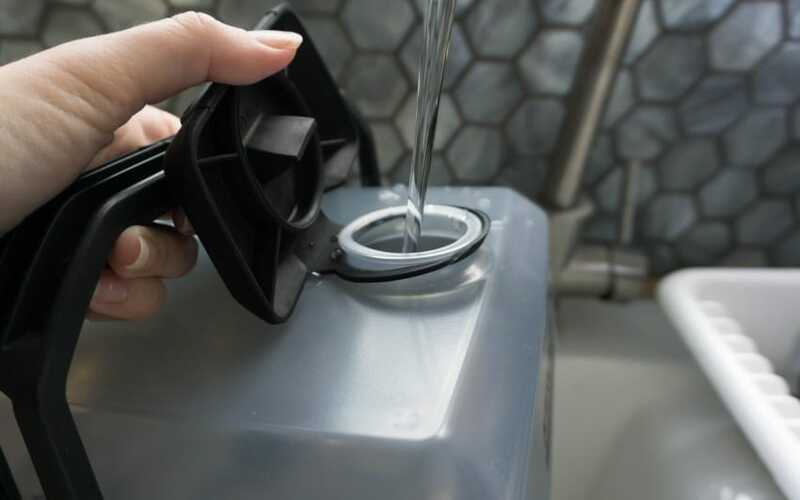 This makes sure the water tank stays locked in place when in the boot of the car. It comes with a 5 bar pressure, which if your like me and that means nothing to you! However don’t worry the pressure isn’t as strong as your ones you would clean the patio with, and blast off dirt!! 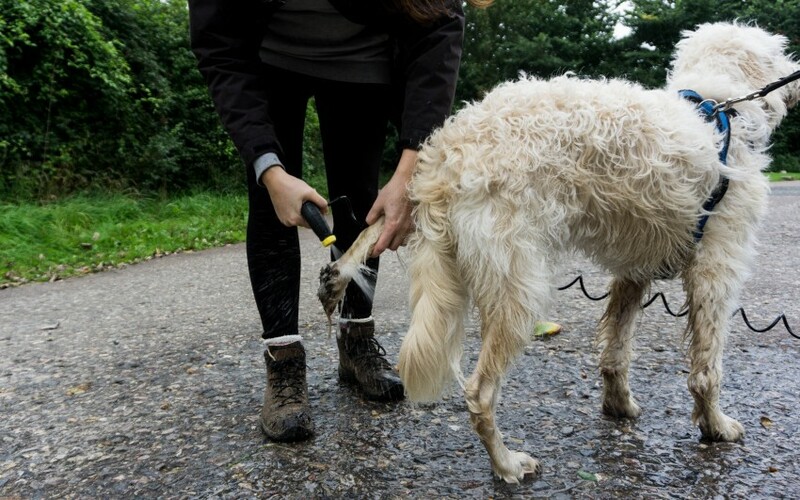 It has enough pressure in it to be able to gently remove the mud from shoes, and dogs legs. 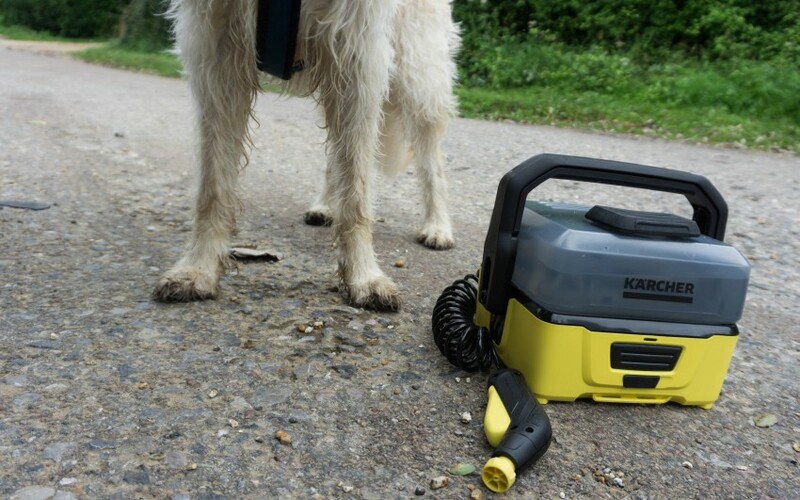 Please note this is not high pressure, the Karcher Portable Cleaner is gentle on your dogs legs and is not strong enough to hurt them. The Karcher Portable Cleaner cleaned up the dogs legs really well, here are a couple of pictures of before the dog walk, and after washing. 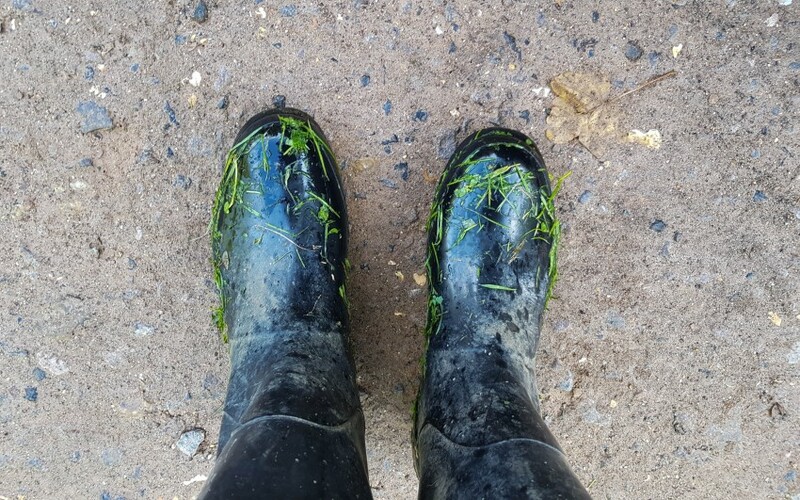 It works great at getting off the mud and grass and really does make my job easier. Then I used it on our boots after our walk, and I was very impressed with this. Nice to be able to pop the boots back in the car pretty clean. You may find that your dog is a little unsure of the Karcher pressure washer, it does make a rumbling noise and sprays out water onto them. Which may surprise them at first! So make sure you make it a positive experience, and especially the very first few times. Have some tasty treats to hand to offer. 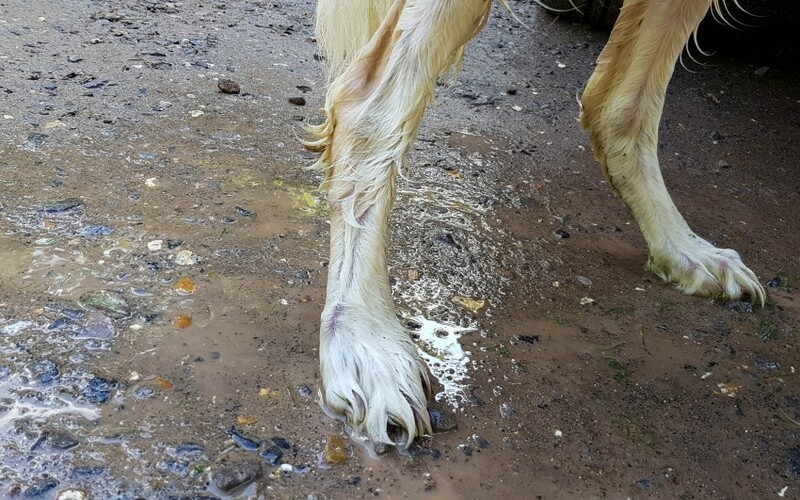 I would suggest you don’t even turn the pressure washer on at first, introduce it to the dog at home and just offer some treats for the dog going near the pressure washer. Once they’re happy to go near it, turn it on and offer treats to them. Once they are happy with this stage, then you can progress onto washing them. Do offer treats with this as well, and each time you wash them they will be happy as they are getting some tasty treats at the same time! The Karcher portable pressure washer states that it has a run time of 15 minutes, so you can easily use it a few times before having to recharge it again. The light at the front will start flashing when the battery is running now. Recharging is easy by plugging the charger into the front, and takes around 3 hours to charge. This is easily done by an opening on the top of the Karcher Portable Cleaner, although I did find it a little tricky to re-close the rubber seal lid. There is a certain knack to it, but I am sure I will get the hang of it with some practice! Once this is closed properly I haven’t found the tank to leak in any way at all. It comes with a 2.8mtr spiral hose, which is perfect for moving around your dog, or various people. You can use purchase various accessories to go with the pressure washer. Including a pet accessory box which can be attached underneath the pressure washer, including additional conical jet nozzle, microfiber towel, and pet brush to brush out stubborn dirt. There is more accessories, for bikes, and different types of brushes. I like the fact that the hose can be tucked away in the bottom when storing it. 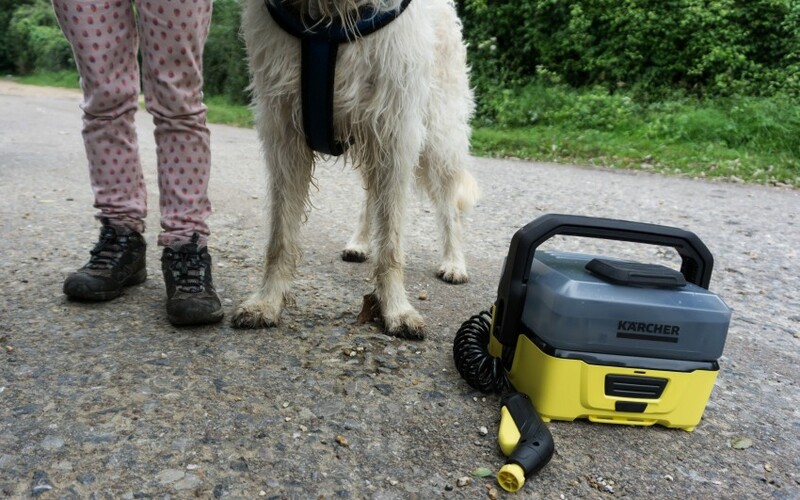 Overall I am really pleased with the Karcher Portable Cleaner, I have been using this on every muddy dog walk. 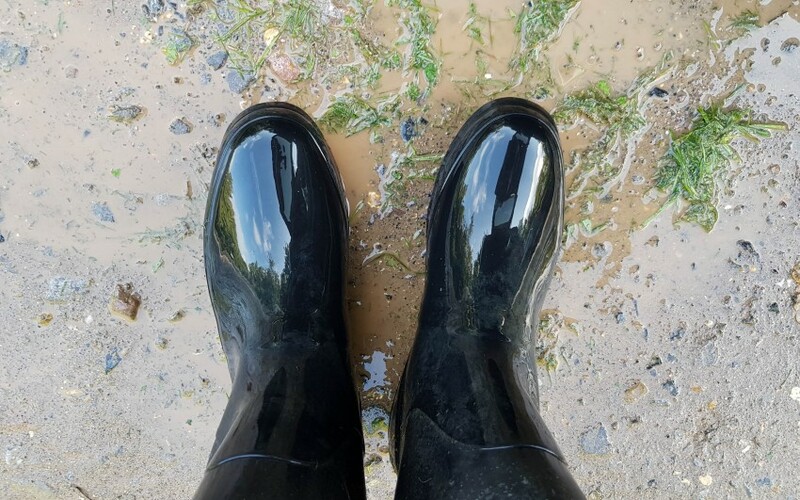 Not only have I been using it on the dog, I have been using them on my muddy boots and wellies. They were great for this, and nice to not get all the mud in the car all the time too. 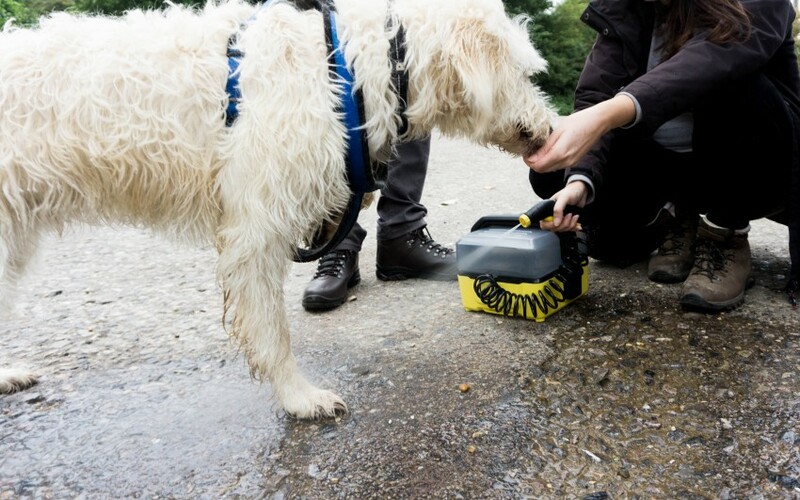 You need to hire that out to all the dog walkers, what a great idea and something I need with my dog who loves going in every river and muddy puddle! The Karcher portable pressure washer is a little pricey, at RRP £149.99, although look out for prices lower than that at places like Amazon*. However I do think it is worth it, and if you are using it regularly you will love it as it will save you so much time and mess of cleaning the car, and house after your daily dog walk! 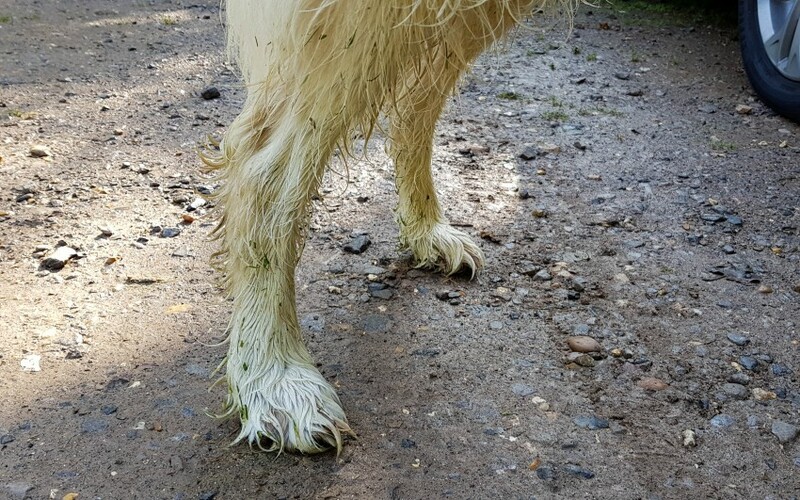 For more ideas on how you can cope with muddy dog walks then please do check out this post, this would be great to reference to use after your dog has been washed down with the pressure washer. *We received this product for the purpose of this review, however all words and opinions are honest and of my own. Post contains affiliate links. This looks like such a great product. I could do with one myself at the kids always seem to get their shoes dirty before we get into the car to come home. I supposed that’s kids for you. What a multitasking product. I liked the fact that it can be used to clean all sorts. 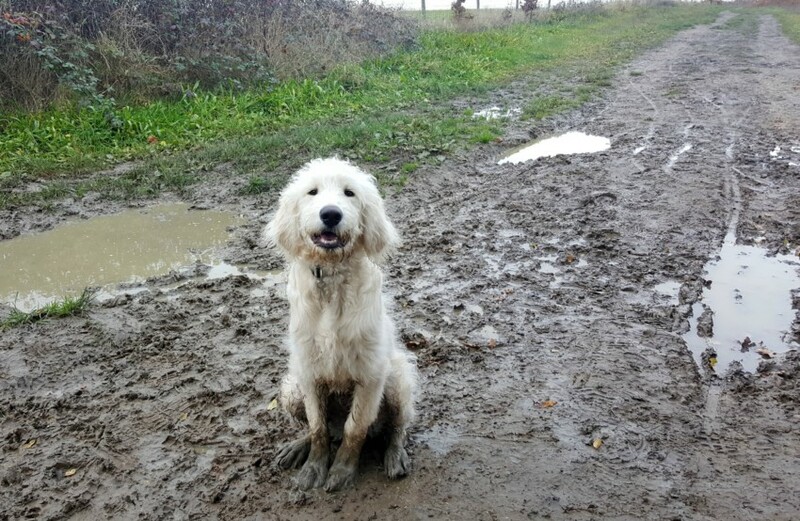 Yes luckily they have improved that path now, so not quite as much mud on that walk…however he still finds more mud anywhere else he can!! Oooo I’m sure my pops would love this little baby! He into gardening so I think it would make a great gift for his 50th this year! Oh yes wash off his muddy gardening boots! Thanks, great idea isn’t it! lol! Yes my hubby is the same! Your dog is a total sport. Lots of mud at this time of year so not a bad idea at all. He’s great fun and keeps me on my toes!! Thanks, it helps me out so I’m pleased! Oh I totally need this for our dog! He is white and attracts dirt, I could so use this in my life! Light coloured dogs are a nightmare in the winter aren’t they!!! Oh yes a festival is a great idea!! We have a Karcher, but it isn’t portable. I want this too especially since we have a dog and a child, not to mention we live by the sea. Can you imagine what that means? Too much sand and mud. This would be perfect for us! Ah yes sand, mud, water, salt from the sea!! Great combination!! THIS IS AMAZING! What a genius little thing. This would be super useful to hose down the pram and trike wheels – I hate having to put the dirty wheels back into the car. Oooh, I’m so tempted by this. Perfect for that isn’t it, used to drive me potty putting muddy wheels in the car and when you fold it up it goes over the seats/basket! 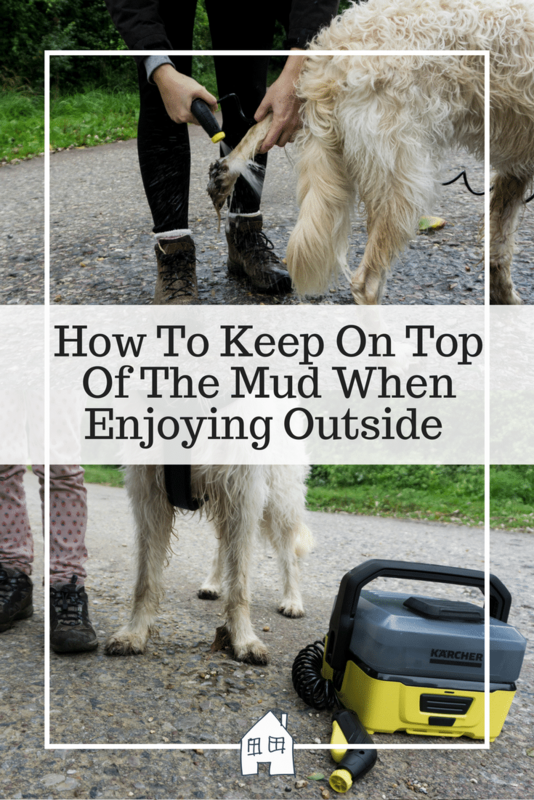 This is perfect for the muddy months ahead….I love that you can use this on your dog as well as on muddy boots! Everyone is getting washed off now!! We’ve been after a pressure washer for some time now and this looks ideal! Especially with how muddy our dog gets as well! I didn’t even realise they did little ones like this! Ah that’s a shame, during the winter I am usually covered in mud so perfect for us. However I would love to be able to dress up smartly each day and not have to worry about the mud too! 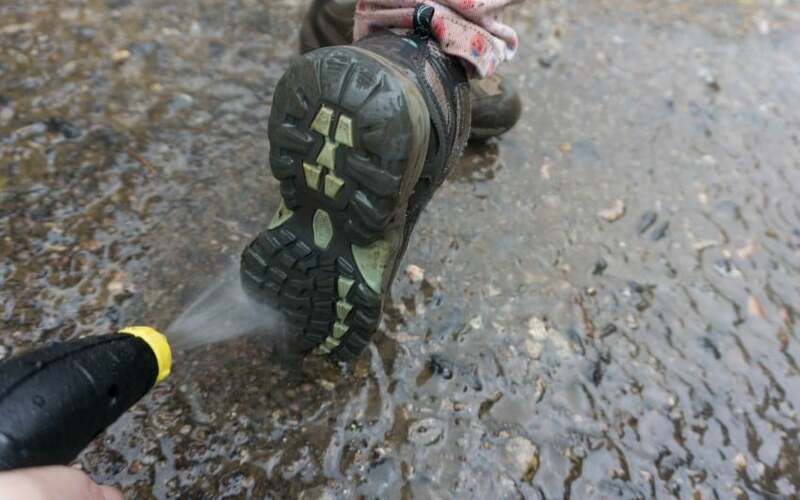 What a handy product for the muddy months – the amount of times the car or house has been covered in mud from wellies. This would save all the mess! Super handy is’t it, I am going to blast everyone off before step foot anywhere near the house/car now! !